Examples, solutions, videos, worksheets, and activities to help Grade 9 students learn about dividing and simplifying radicals. The following diagram shows some of the rules for dividing and simplifying radicals. Scroll down the page for more examples and solutions. Students learn to get rid of a radical in the denominator of a fraction when there are two separate terms in the denominator, by multiplying both the numerator and denominator of the fraction by the conjugate of the denominator. 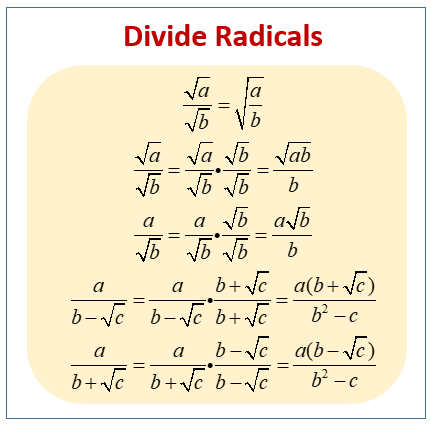 Learn how to divide expressions involving radicals.